Swiss-Belhotel International to launch property in Arabia. “Expected to open 4th quarter of 2016, Swiss-Belhotel Al Khobar will be the city’s address offering a unique 4-star experience to all guests and visitors from around the world”, he added. Swiss-Belhotel Al Khobar will have 100 rooms with modern contemporary interiors and two food and beverage outlets as well as shops for rental. 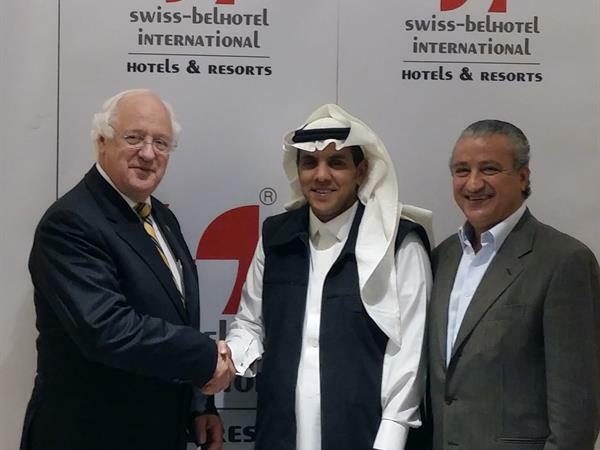 From left to right: Gavin M Faull, Swiss-Belhotel International Chairman and President, Mohamed Al Malki, Swiss-Belhotel Al Khobar Owner, Noel Massoud, Swiss-Belhotel International Vice President – Operations and Development – The Middle East. For high resolution version, please click here. Swiss-Belhotel International currently manages a portfolio of more than *135 hotels, resorts and projects located in China, Vietnam, Philippines, Malaysia, Indonesia, Bahrain, Iraq, Kuwait, Oman, Qatar, Saudi Arabia, United Arab Emirates, Australia, New Zealand, Bulgaria, Turkey and Georgia. Awarded Indonesia's Leading Global Hotel Chain for six consecutive years, Swiss-Belhotel International is one of the world's fastest-growing international hotel and hospitality management groups. The Group provides comprehensive and highly professional development and management services in all aspects of hotel, resort and serviced residences. Offices are located in Hong Kong, New Zealand, Australia, Europe, United Arab Emirates, China, Indonesia and Vietnam.